I finished it in the nick of time! 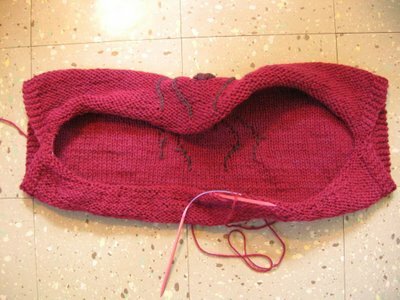 You know, most knitting patterns read something like this – “Continue knitting the k2p2 rib for 3 inches.” I don’t know if I’ve ever read one that instructed the knitter to knit like mad until 3 o’clock, but this is what I had to do! You see, it suddenly occurred to me that this wedding was to take place in Louisiana in April and not Colorado in April so the wool-shrug plan was just not going to work. Have you ever been to Louisiana in late April? Suffice it to say that it’s Hot and Steamy…. So – on to plan B! Knit a whole new shrug! I ditched the wool spider idea, and jumped onto the lace idea on the very day that I was packing for the trip, which is the very best time to decide on a big project, isn’t it? I raced to my LYS and stocked up on some black Luster Sheen, which was the exact perfect shade of a black, with an almost reddish tint. I went to the store specifically to pick up some Sinfonia, but alas, the black Sinfonia was blue black and that simply wouldn’t do, lol. When I should have been packing my bags, I was instead surfing the internet in search of the perfect lace pattern, and I found it here, Print O' the Wave Stole , and here in pdf - I love this lace pattern, and as you can see, three repeats of the main portion of the lace was a perfect fit! I knitted all the way from Colorado to Louisiana, then knitted in every spare moment on the day of the wedding. Based on my experience with the interrupted Spider Shrug, I knew that the cast-off step would take about 30 minutes, and this is why I gave myself the 3pm cut-off. 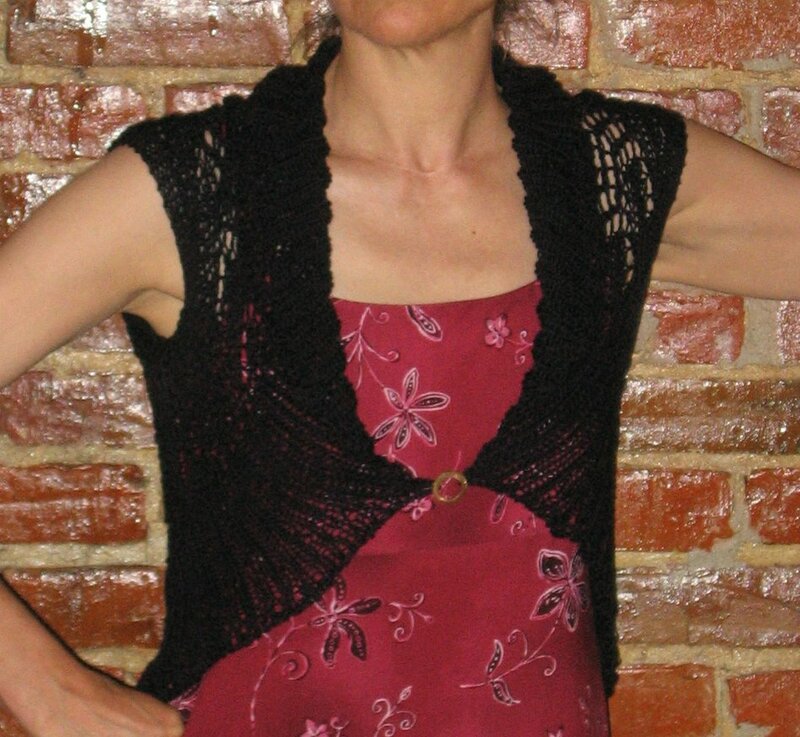 I followed this shrug pattern, Circular Shrug - here in pdf - but I changed it a bit. 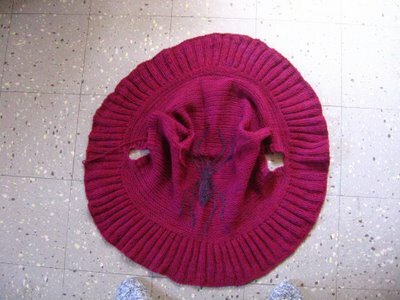 For the spider shrug, I provisionally casted*-on, knitted the back with the lovely spider, then folded it over, picked up the cast-on side, and knitted in stockinette, in the round for about ½ inch, then began the k2p2 rib. Well, this idea worked perfectly well, but it was way too small! 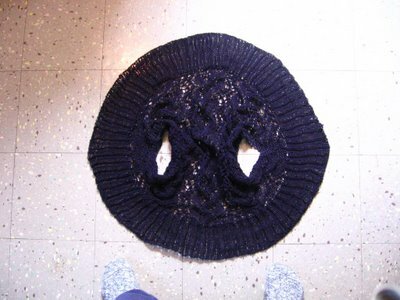 In the planning stages, I decided that the original shrug would be too long, since it was intended to be worn with a summery dress, so I’d simply knit the back shorter. Only… this doesn’t work. Each of the 20 inches called for in the pattern are necessary, so don’t scrimp – knit every single inch! Lesson learned. This is how I knitted my black lace shrug - I provisionally casted-on, knitted the lace pattern for 20 inches, then folded it in half, picked up the provisional cast-on edge, and knitted twice around in stockinette. Then, I began the K2p2 border by knitting a stitch, backwards-loop-increase one, purl a stitch, backwards-loop-increase one, and so on around. Then, continued, until 3pm (ha! ), in k2p2 ribbing, then cast-off in a real big hurry, because I still had to iron my dress, and apparently I also had to burn my left fore-arm, as you can see in the photo. 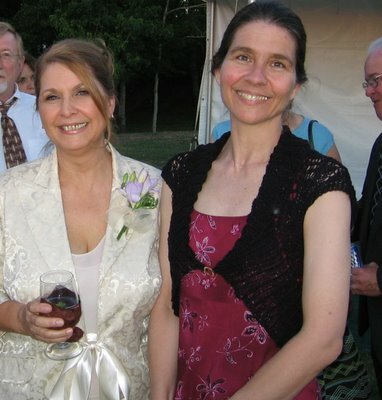 The wedding was an hour away from my family home, so my sister, the mother of the bride (see photo), rented a bus to drive all of her friends and family to the wedding. I’m so glad for this hour, because it was on the bus that I sewed up the arm-holes, and worked in the various ends of yarn. As this was Luster Sheen, and ickycrylic, I was afraid that the ends would work their way back out, so I sewed them down with black sewing thread. My mom loaned me the little circle pin (thanks mom!) and provided the thread and needle (thanks mom!) and I was ready just in time! Whew! However…. The knitting until 3pm part didn’t provide enough time, so I’ll search for the end of the yarn (how much you want to bet that I’ll have to cut???) and rip out the cast-off, and then knit a couple of more inches onto the edging. I think it will look better with a larger collar. Now that I know how this shrug pattern works, and that the 20 inch measurement is truly the magic number, and that the 3 inch arm-hole seam is another magic number, I’ll fix the spider shrug by ripping out the k2p2 edging, continue knitting in stockinette in-the-round for 3 more inches, then knit the k2p2 edge for 5 inches, then I’ll be done, yay!!! I hope to be able to wear my spider shrug this summer – who knows, maybe even with the dress that it was originally intended for! We have cool evenings all summer long, so maybe I will. Here you see the shrugs, and you can see how much shorter the spider one is from the underarm to the center front. *Knitting Grammarians – does one say “casted-on” or “cast-on?” I don’t really know, but “casted-on” sounds kinda silly, and “cast-on” doesn’t have that past-tense flavor that I’m looking for here. Hmmmm….. Wish I would wear something like that...my ample bosom may not be such a thing for that kind of shrug though. What a beautiful lace shrug! 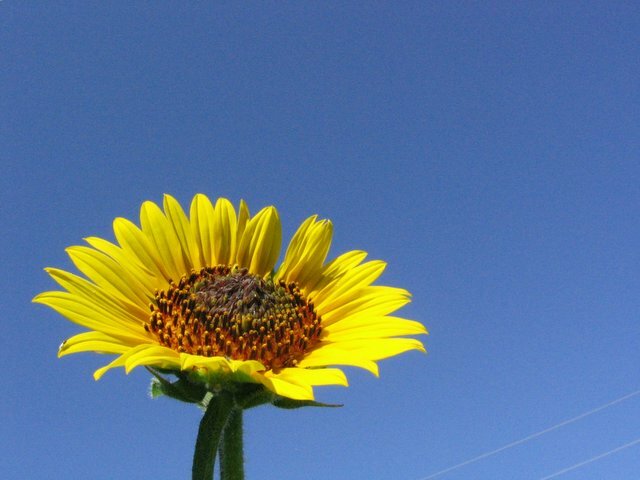 I'm enjoying your blog so much! I'm Cooking Up A Shrug!